How to correctly apply the thermal interface material (TIM)? 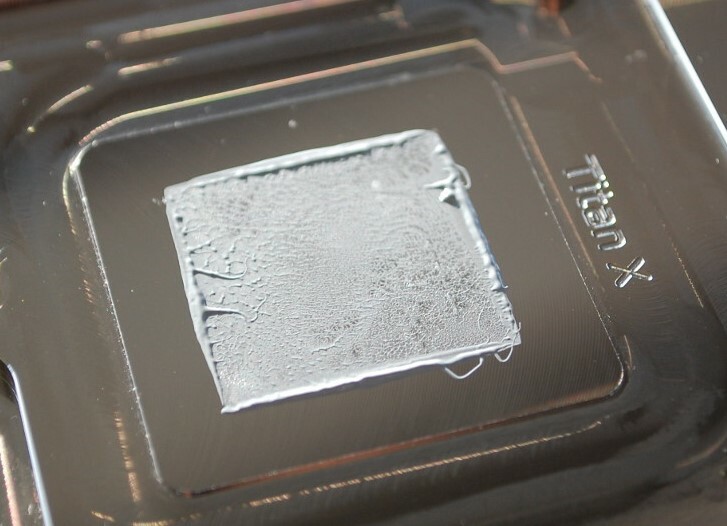 Every now and then we get a question how to apply the thermal pads or thermal grease correctly, therefore I decided to write a short blog post about it. First, I’ll present our TIM portfolio and then show a thing or two about the correct applying. The thermal pads consist out of about 95% Aluminum oxide (Al2O3) and 5% Silicone resin. The thermal conductivity is 3,5 W/mK and operating temperature from -55°C up to 200°C. Looking at the picture above, you can see that the thermal pad deflects by 45% when applying 40kPa of force. 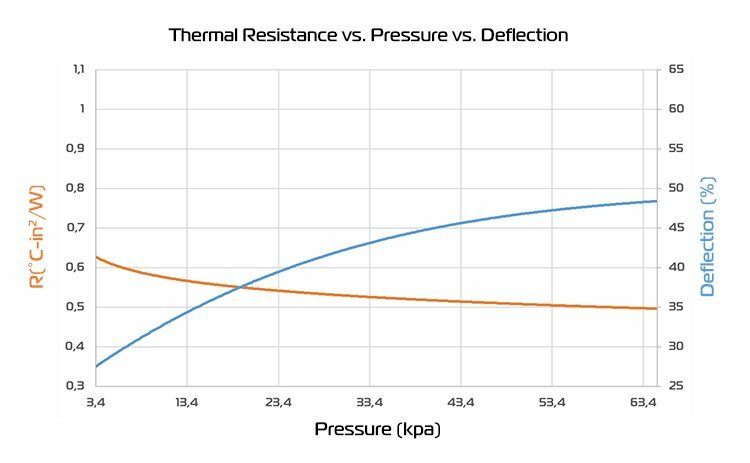 The thermal resistance is relatively steady so that tells us that it will perform well through the wide range of applied pressure. The thermal pad should cover the whole surface, from which we want to dissipate the heat. Usually it helps if the thermal pad is a bit bigger than the previously mentioned surface. Using the right standoffs and designing we (EK) make sure that the gap between the copper cold-plates and the cooled elements on the PCB is just right. The bottom picture shows the “healthy” thermal imprint of the MOSFETs on the motherboard after one assembly/disassembly cycle of the monoblock. 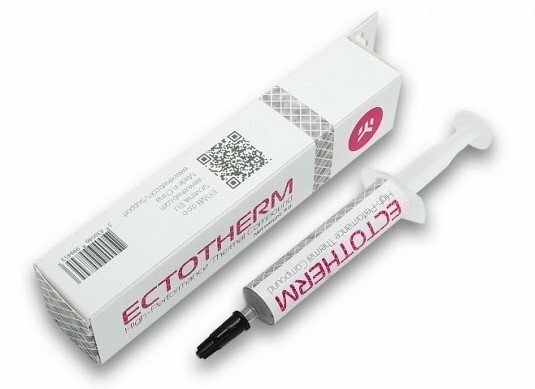 Thermal grease is used mainly at contacts of the cold plate with GPU or CPU processor units. 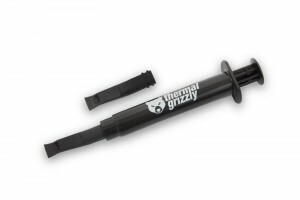 At EK we are using Thermal Grizzly Hydronaut and EK-TIM Ectotherm. Both are one of the best in its class and price range. The Thermal Grizzly Hydronaut is used at extreme overclocking because its operating temperature can be below zero degrees Celsius and the thermal conductivity doesn’t suffer. 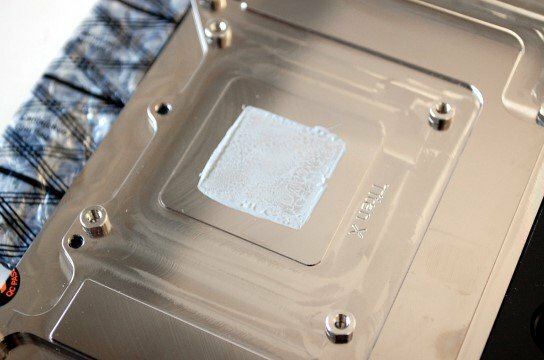 EK-TIM Ectotherm performs best at basic to extreme overclocking and is also easier to apply because it is less dense. Thermal greases often consist of silicone compounds and must be applied in very thin layers. 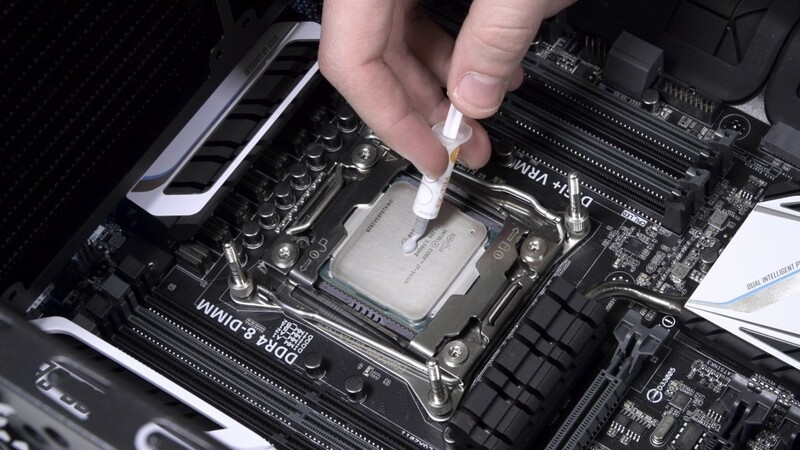 Because of the higher density, you must apply Thermal Grizzly Hydronaut thermal grease with applicator and cover the whole surface of the chip. At EK-TIM Ectotherm it is enough just to apply about two rice grains of the grease, depending on the chip size, on the center of the chip. The cold plate from the cooler will expand if it’s installed correctly. We can summarize that choosing the right TIM is very important. You must beware that you take the right thickness (in case of thermal pad) and applying method (in case of thermal grease). If these conditions are taken into account, you can expect your hardware to run flawlessly even at high overclocks.